Ceramic stains make it possible to create glazes that fire to just about any color of the rainbow. But one drawback is that the glaze surfaces colored with ceramic stains often lack the depth of those glazes that use ceramic oxides. The lanthanide metals, also referred to as the “rare earths” can produce some cool colors for which you previously may have turned to a ceramic stain. In this post, an excerpt from our handbook, High Fire Glazes, David Pier explains the advantages of rare earth colorants, and shares some great glaze recipes! – Jennifer Poellot Harnetty, editor. Learn the difference between ceramic oxides and ceramic stains! The lanthanides are the metal elements numbered 58 to 71 (starting with 57, if lanthanum is included). Oxides of the lanthanide metals make up most of what are commonly known as the “rare earths.” Despite their name, many of these are not all that rare, and relatively recent improvements in separation technology and increases in mining have brought prices down signiﬁcantly. Several of the lanthanide oxides give dramatic, vibrant colors at all ﬁring ranges. Despite this, their use as colorants has been nearly nonexistent. The recipes in our new release, High-Fire Glazes, have been used and tested by more professional artists, over a greater length of time than any other firing range. With hundreds of high-fire glazes recipes and tons of technical discussion, this books allows you to reap the rewards of all that testing! High-Fire Glazes is available in the Ceramic Arts Shop. The primary advantage of using pure oxide colorants over stains is the possibility of transparency or translucency. In order for a stain to maintain its color, it necessarily remains as a distinct particulate suspended in the glass, thereby opacifying as it colors. Pure oxides can color while leaving the glaze otherwise transparent, as long as they fully dissolve in the molten glass, which the lanthanides easily do. 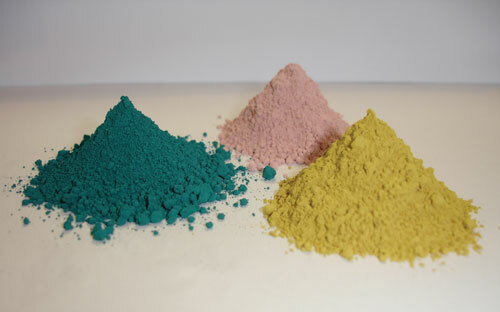 Dissolved oxide colorants are also much more sensitive to small changes in the glaze, responding to other colorants, ﬁring and cooling conditions, and the clay body. In other words, dissolved colorants are responsible for all of the subtle effects that make glazes so unlike paints. A glaze colored with a pink stain will look much like pink paint, while a glaze colored with a pink oxide will look something like sugar candy. 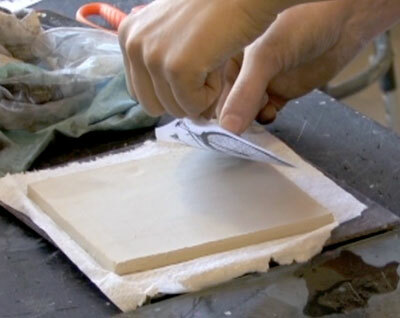 Of course, it is necessary to apply it to a light-colored clay body to prevent muddying of the color. The lanthanide oxides are very dense, which may cause some glaze batch suspension problems but improve the ﬁred results. Denser glazes have higher refraction (light-bending ability), making their effect on incident light more like diamond and lead crystal, and less like plastic. While the lanthanides have not been researched as much as the commonly used metal oxides, they have low acute toxicity and almost no evidence of chronic toxicity. In fact, the lanthanides are less toxic than copper, cobalt, nickel, zinc, and other commonly used transition metal colorants. Of course, it’s always important to check the materials safety data sheets (MSDSs). None of the lanthanides volatilize signiﬁcantly, even at Cone 10, allowing the formulation of extremely hard and durable food-safe glazes. Despite the very high melting points of the lanthanides, they usually have a strong eutectic effect, ﬂuxing high-ﬁre glazes at the concentrations most likely to be used. I suspect there might be some difﬁculty in getting higher concentrations to dissolve in low-ﬁre glazes, but I have not tested sufﬁciently to prove this. Since neodymium is a more potent colorant, it will be more versatile in low ﬁre, and I have seen successful low-ﬁre glazes using neodymium. The high melting points and extremely high vaporization points also mean that the lanthanides will not be volatile under normal oxidation- and reduction-ﬁring conditions. However, the three lanthanide oxides used in my recipes are affected by reduction—sometimes for the better, sometimes for the worse. Neodymium oxide, a blue powder, can give an intense sky blue color under reduction in amounts around 1%. In oxidation, it is a weaker colorant, but it gives a unique lavendar color that changes to blue, purple or green under different artificial lighting types. The colors are not very sensitive to the glaze base, except additions of iron oxide quickly shift the blue and lavender colors to gray. Praseodymium oxide is a black-brown powder. By itself, it can give intense lime greens at 6–9% in oxidation. In reduction, the color is slightly shifted away from yellow-green towards green. Under 1% can result in a green celadon color with traces of iron oxide in reduction. Erbium oxide, a pink powder, can give pinks that shift towards a less unique lavender-pink in reduction. It is a weak colorant, so it is best used in high concentrations (over 8%). Of the lanthanides, it is the most expensive per pound, but the only way to get translucent pink. It is also quite dense, absolutely necessitating the use of CMC gum. As previously mentioned, all the lanthanide oxides are dense. Less dense carbonates may soon be available, which should reduce settling problems, but in the meantime I have resorted to additions of CMC gum. If you are unfamiliar with the use of CMC, it will take a bit of getting used to, but you may ﬁnd, as I do, that the advantages are many (see page 19). Glazes with CMC will seem very thick in the bucket without going on the bisque very thickly. Carefully note the suggested raw glaze consistency and speciﬁc gravity (1.6 g/ml) suggested in the recipes. These recipes are the result of a short period of mostly high-ﬁre glaze testing conducted with the aid of David Peters. (I was initially inspired by the work of Morgan Ringer, who began experimenting with neodymium oxide after observing glassblowers using it.) All were applied to Grolleg (English kaolin) clay bodies, which most clearly display the clean colors. Undoubtedly, there are many undiscovered combinations of these and other lanthanide oxides with different glaze bases, with each other and with more traditional colorants that will yield many new colors in many types of ﬁrings. bases, ceramic stain, clay, cmc gum, eutectic, high fire, iron, oxidation, reduce, reduction, short, suspension. Does anyone know what happened to David Pier? He has disappeared from the Internet- out of date (2005) website, and no current contact information. Is he still working in Ceramics? I am trying to convince my ceramics professors to let me do some erbium glaze testing, but they are rightly concerned with toxicity and safety hazards of erbium oxide because they have little to no experience with it. I’ve checked all over the internet to find Mr. Pier’s email to try an contact him with questions. If anyone knows his contact information or the info of anyone experienced in using erbium oxide please reply to this comment. Thank you. There are no recipes in this post. Hi Lori, it appears that all our images from this post disappeared! We have uploaded them back into this post. Thank you for bringing this to our attention.